This is one of my many pathetic attempts at looking “tough” for the camera. As you can see, failure abounds. I’ll get ’em next time. 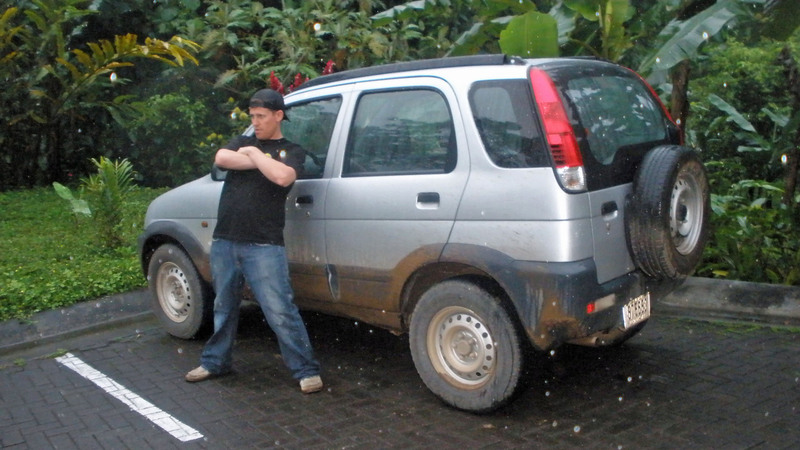 This lil’ beast in the photo handled remarkably well over a few of Costa Rica’s “roughest roads” (a debatable observation, Lonely Planet). She might be small. She might be a manual, bare bones piece of machinery. But she packed a punch around muddy corners and up slippery inclines. Me? Well, I felt like I was back home driving Dukes of Hazzard style. If I had a dime for every eye roll my wife produce while I was driving this thing, I would be a very rich man. Anybody else love driving in the country, especially in foreign lands?